One of the great things about the Arduino is the ability to expand your board using shields which provide all sorts of additional capabilities. Interestingly, you can even “stack” shields so that you can have lots of different combinations of added features. Whilst it might look easy to simply stack shields together, not every combination of shields can be stacked together and there are a number of complications that should be considered. Fortunately our friends at Freetronics have put together a great tutorial which explains the ins and outs of stacking Arduino shields. 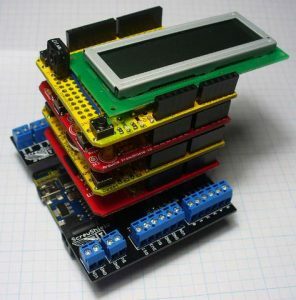 This tutorial should provide you with really useful information if you have been stacking Arduino shields in your home automation projects. Checkout the following link to find out more. Have you successfully stacked shields in the past? Are you working on a project you would like us to feature in this blog? The team at SuperHouse Automation would love to know! Tell us about it in the comments section below or on Facebook and Twitter.